August 22, 2010: the first photo I took of my (then) new 19" aluminum bike frame. Several years ago, I built my own mountain bike. I used a plain black aluminum hard tail frame I bought online. That bike went on a lot of adventures - The Kingdom Trails in Vermont were especially grand - and I went over the handlebars a few times. Still, I didn't have that frame in place very long - for I eventually switched over to a full suspension frame and the black frame was turned into a single speed. My workshop is like The Giving Tree in reverse. But that frame wasn't in place very long either, for I raided that bike for parts for other projects, and the frame was eventually stripped completely - and looks like this today. That frame made me the person I am today, for building a mountain bike - or building any bike for the first time - was just a great experience for me and unlocked something in my creativity. 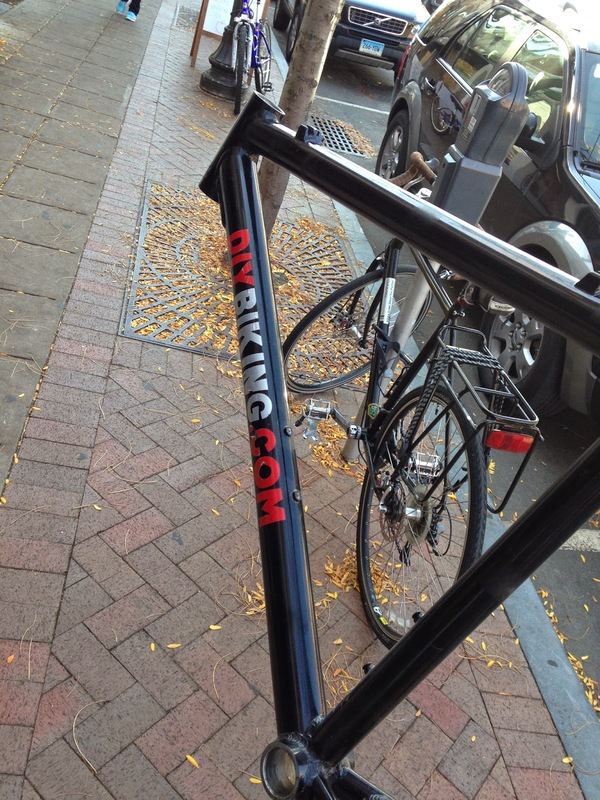 The photo of the down tube was even the logo of this site for a couple years. However, I need more space in my shop and, still unable to weld aluminum, that frame just had to go. So when I put together a box of pedals, seats, cranks, tires and other things to donate to the Bridgeport Bike Co-Op, that frame was added to the pile. 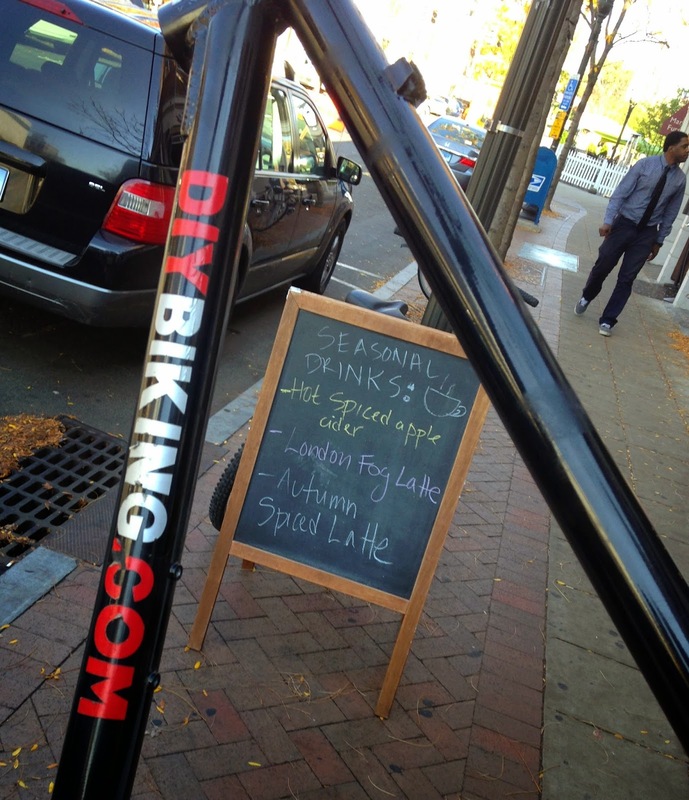 I'm not very sentimental about physical objects - if I did I'd become a hoarder - but I suddenly, today, realized that the black frame with the red and silver DIYBIKING.COM letters (hand placed, like on every bike I have) missed out on a lot. My recumbent. The Dahon Matrix. The Mystery from South Norwalk. My Bike Friday New World Tourist. The Bikeducken. And, most recently, my city bike. They've all experienced the city of Stamford and the wonder of travel more than the Founding Frame, and I felt like the black frame needed a final journey - like the tribute show Ed Sullivan never got. I never even brought it to Lorca, so today I decided to do just that. On foot. Moments after entering, I learned that the rumors were true: Lorca is creating its own apple cider donuts in-house, and will be doing so at least through November. 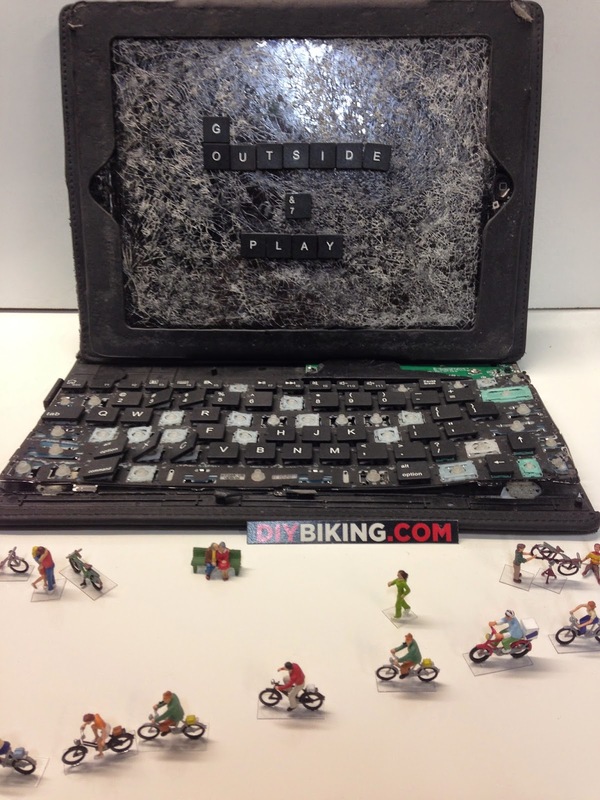 The black frame and The Donut Lover's Guide to Bicycle Commuting: both are roots of this web site, and both were coming back into the spotlight. I was also thinking about buying a Samsung Galaxy Tab S and taping $100 to the back instead of buying a new iPad but that's neither here nor there. I bought four donuts and walked down Bedford Street carrying the frame and the bag of donuts in the same hand. I wasn't sorry I was giving the frame up, but rather hopeful: it's a great frame, it got to go to an outstanding coffee shop - and I'm sure someone will soon turn it into their own bike. Because I don't have a bike trailer big enough to carry everything safely,**, I was forced to bring my car to Bridgeport. 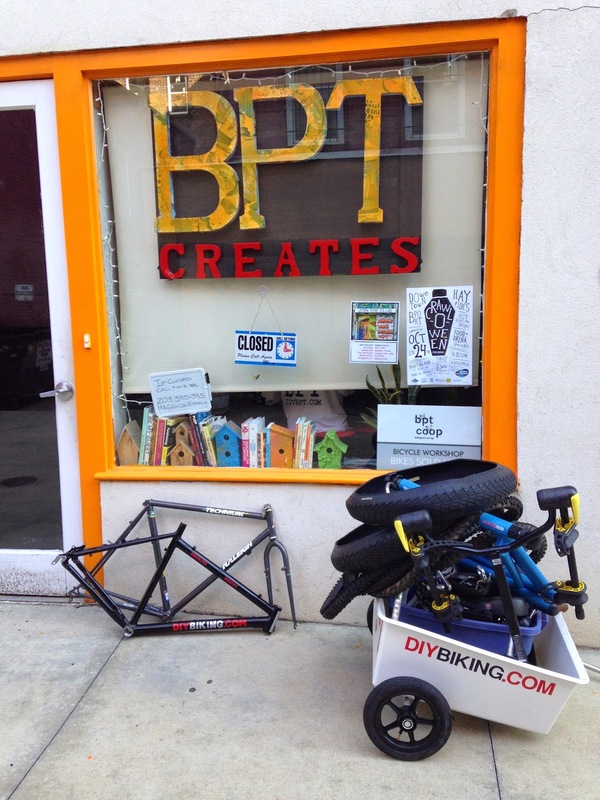 I still used my homemade bike trailer as a hand truck to drag the parts to BPT Creates. Oct. 17, 2014: the last photo I've taken of the Black Frame. I dropped everything off inside, and it wasn't until I was dragging the empty trailer back to where I had parked my car that I realized I had taken the last photograph of my black frame. Great memories, and I think I'm honoring the frame the right way by allowing someone else to get the same joy I had when building a bike. If you live in the Bridgeport area and want to donate some used bikes or bike parts to the Bikeport Co-Op, please let them know at bikeportct@gmail.com. Also: they are doing their monthly Big Bike Ride tomorrow at 1:00pm (starts at McLevy Green) so check it out. 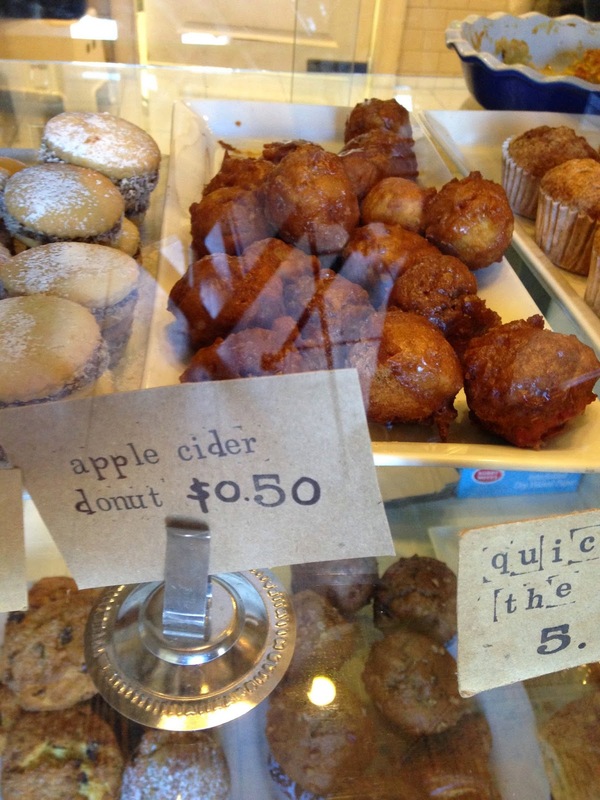 Also: go to Lorca and have some of their apple cider donuts. I have no experience with the latter product but Leyla (the owner of Lorca) is to baked goods what Walter White is to meth. Thanks for reading and thanks for riding. **I will remedy that problem.